All Good Beer: Chuchkey in Washington, D.C. I had read great things about the Churchkey and it was conveniently located just a few blocks from the hotel. It does serves bar food and other small dishes, but if you want a more formal restaurant with the same beer available, the Birch & Barley is located on the ground floor. We chose to go upstairs to the Churchkey as we were looking for more of a relaxed evening. Its a long narrow space with the bar along one side and booths along the other. There's also an area in the very back with more intimate and casual seating around low tables. 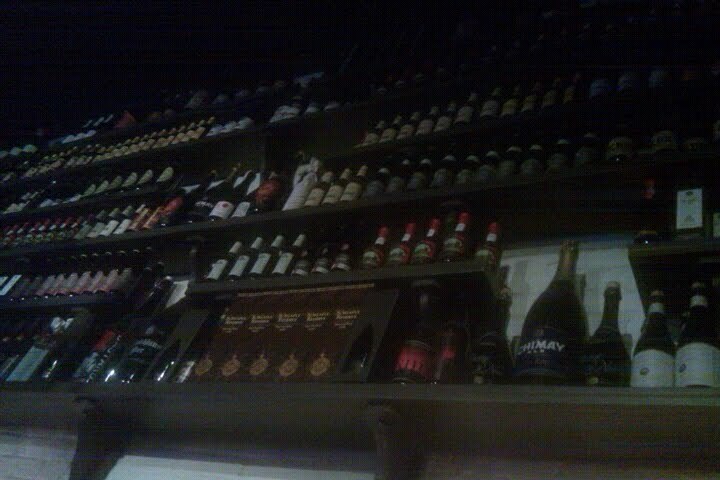 Shelves on the wall above the booths stretched to the high ceilings and contained bottles of rare and highly rated beers (photo to the right). The food menu was small but contained some great sounding items. We settled on a Caesar Salad and the Mac & Cheese Sticks (which were highly rated and suggested on various online review sites). 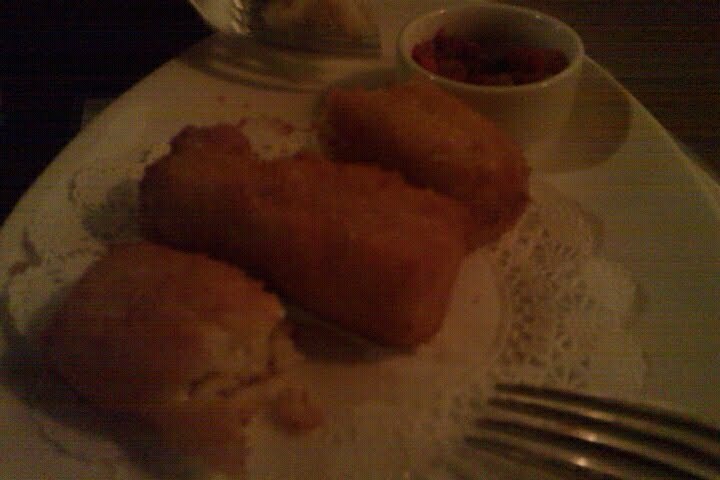 Basically, it's Mac & Cheese formed into long cubes which are covered in garlic bread crumbs and deep fried (see photo to the left). What's not to love about that?!? I also eyed the flatbread BLT Pizza when I saw one being carried past us, but decided we weren't hungry enough. But its the beer selection that originally drew me to this place as they had a very large and varied draft and bottle selection (draft menu). All the draft beers are available as a 4oz sample or a full glass. Depending on the beer, the samples ranged in price from $2 to $6.5 and the glasses ranged from $5 to $13. I kept to just drinking samples of draft beers so that I could get the chance to try more beers. The samples may not have been a good economical choice and I would have loved to have had a full glass or bottle of lots of the beers, but there was just too many different one that I wanted to try. 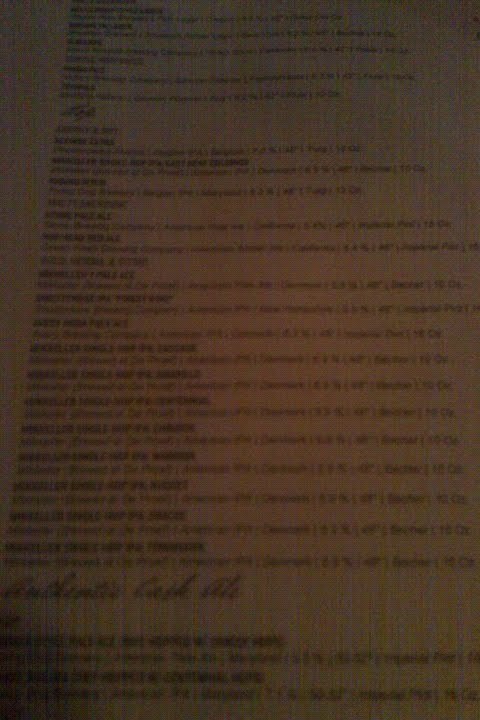 As I glanced down the draft beer menu, my eyes were were immediately drawn to the list of Single-Hop IPA's from Mikkeller (poor cell phone camera photo to the right). These are IPA's that were brewed by Mikkeller at De Proef Brouwerij using a single type of hop. Since I have a Nugget hop plant growing in the back yard (see my other blog Hops In Pots) I had to order the Single-Hop: Nugget. I also ordered the Single-Hop: Warrior as its one that I was thinking about using in my next beer. The Nugget was not nearly as bitter as I had figured it would be as its a hop with a fairly high level of alpha acids. Although, they may have used it more for aroma and flavouring then bittering. The Warrior was more in line with what I was expecting, fairly bitter with a strong citrus flavour. From there, I moved on to the Short Batch #6 from Smuttynose Brewing. The Short Batch Series are experimental beers brewed in small batches and released as draft only. Depending on how well an individual beer is liked, it may then be considered for release as part of the Big Beer Series. The #6 was a Tripel aged on oak chips with a 9% ABV. Aromas of Belgian yeast and light citrus with a hint of oak. Sweet malts, fruit and yeast in the flavour with the oak having a stronger presence then in the aroma. Very smooth and drinkable. I recently purchased a bottle of Interlude, but as with most beers that I have from Allagash, I planned to age it awhile before drinking it. Since they had it on tap, I got the opportunity to actually try it. The flavour is a mixture of sweet fruits, spices and a bit of a farmhouse funk. It will be interesting to see how this one ages in the bottle and which flavours mellow and which ones become more pronounced. L'Impératrice (Empress) is an Imperial Stout from Le Trou du Diable (The Devil's Hole), a micro brewery located in Shawinigan, Quebec. I've actually never heard of this brewery and was surprised to find it on tap in D.C. Flavours of roasted coffee and chocolate with a smooth finish. It certainly made me interested to try a few more of their beers if I ever got the chance. I have a few bottles of Fritz & Ken's Ale which is the first of Sierra Nevada's 30th Anniversary series of beers, but its another one that I haven't actually tried yet. Flavours of roasted coffee and chocolate with a bitter hop finish. Another beer that will be interesting to see how it ages and changes in the bottle. I'll probably drink a bottle this spring and age the other bottles awhile. By this time, my wife was giving me me the look and asking how many more beers I wanted to try. She's very understanding about my passion for beer, but I could tell it was probably time to call it a night. I would definitely be at the Churchkey often if I lived in the D.C. area. Note to self: Do not read Steve's blog posts in the morning. The time between desire and first pint is too long, making the day seem veerryy slow.